The first podcast for the prosumer videographer market. If you’re looking for a new and innovative way to reach cutting edge video production professionals, consumers and hobbyists, make your mark with The DV Show- now appearing on iTunes, The Tech Podcasting Network, Podcast Alley, Podcast News and more! Described by listeners as informative, edgy, offbeat, irreverent, engaging — this is a niche online radio program like you’ve never heard before. DV Show listeners are technology-savvy professionals heavily involved in video production. They rely on our podcast and web site to provide them with the tools and information they need to create interesting and creative content. 80% of DV Show listeners surveyed said that they are more likely to seek out products and services after hearing about them on the show. 75% of them said that they listen outside their home; 14% listen while commuting; 11% listen while exercising. 17% have an advanced degree. 25% have income over $75k. 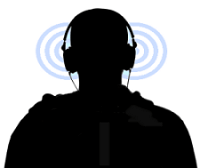 35% spend an average of 2.7 hours on the internet while listening. What Makes The DV Show so special? We love our tribe of listeners. We have their best interest in mind. Once our audience hears or sees your message, you’re instantly recognized as a product or service The DV Show can trust – we take this position VERY seriously. This means if you’re a fly by night product, cheapo service or a get rich quick scheme, we’re not interested. We want to maintain the expectations and confidence from millions of loyal viewers and listeners who know we will not endorse just anyone. Our current sponsors are screened and hand selected.